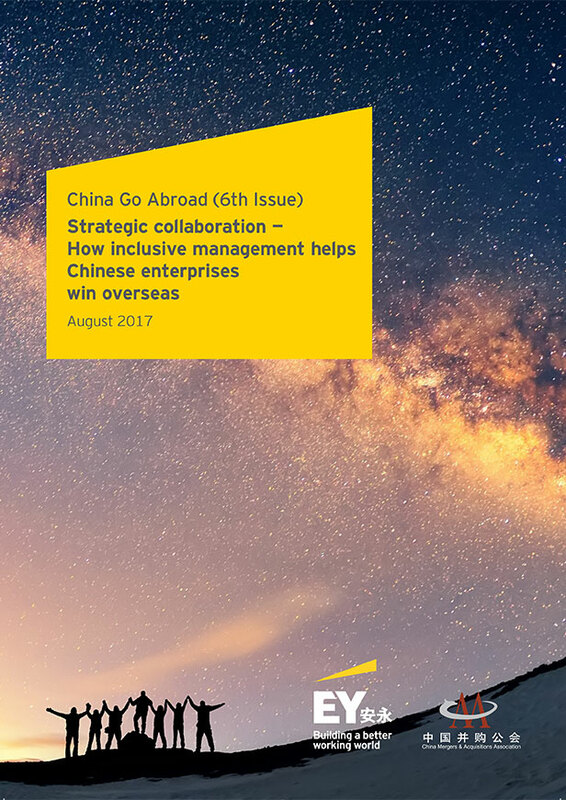 The China Go Abroad (6th issue) is co-developed by EY and China Megers & Acquisitions Association (CMAA). 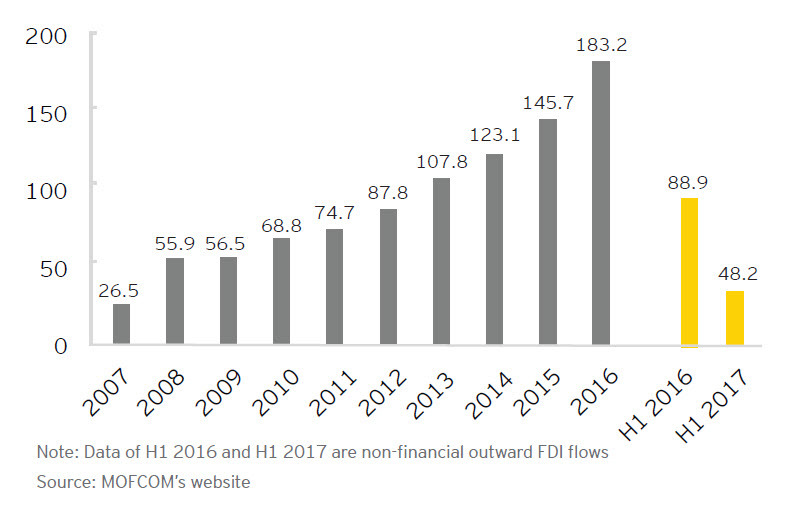 “China’s outward FDI flows reached a new record high in 2016. However, such high growth did not continue in the first half of 2017. Amidst the current complicated and rapidly-changing international environment and under the new policies of the Chinese government, Chinese enterprises have become more rational in making investment decisions when they go abroad. Since the surge in China’s outward FDI flows to US$183.2 billion1 in 2016, Chinese enterprises have slowed down their efforts to “go global” in 2017. Last year’s high base also contributes to the large decline in 2017. We believe that the favorable trend towards Chinese outbound investment cannot be overshadowed by short-term fluctuations. Recent data suggests that Chinese outbound investment has reached a slower and more stable stage after the rapid development seen for more than a decade. 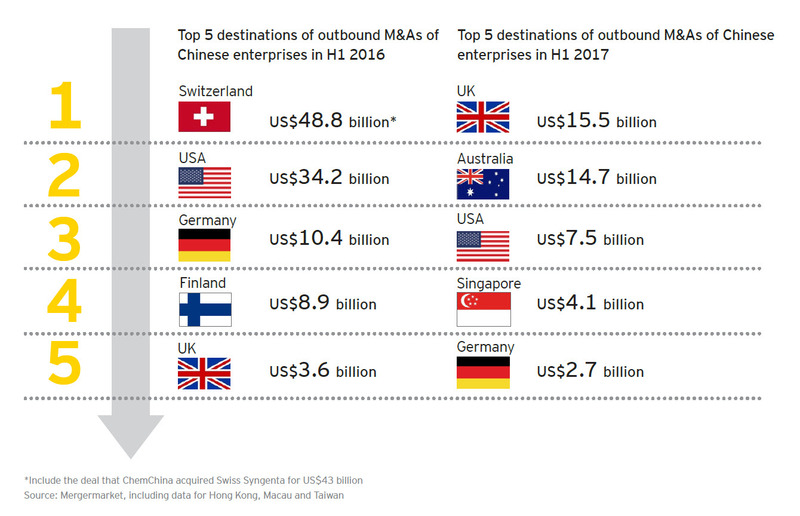 In addition, as we can see from the transition of M&A-focused industries, Chinese outbound investment is becoming more rational. No matter how unstable the external environment to be, to stand out among multinational companies, Chinese enterprises need to make extra efforts to strengthen their internal management capabilities, especially when it comes to post-deal overseas business operations. In H1 2017, we conducted a survey among a number of enterprises on post-deal overseas business management. The results showed that the most severe challenges for Chinese enterprises in managing their overseas operations include achieving cultural integration, and aligning strategic targets. 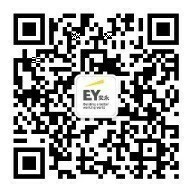 Thus, EY suggests that Chinese enterprises enhance communication with their overseas business and establish a diverse and inclusive business environment in which employees from various backgrounds can respect and understand each other’s differences. In this report, we will focus on the importance of diversity and inclusiveness (D&I) on these enterprises’ successful management of overseas business, based on our extensive experience in assisting Chinese enterprises “going global”. We will also analyze some classic case studies of Chinese enterprises that have optimized their overseas business operations. As 2017 progresses, Chinese enterprises are focusing more on increasing investment returns while expanding the scale of outbound investment. They can deliver successful outbound investment by optimizing their overseas business operations and management, so as to transform China from being simply a large outbound investor to becoming a strong and competitive one. We hope you will find this report useful and insightful for your outbound investment management, as you navigate trends and seek to seize better opportunities. At the end of 2016, Chinese regulators issued policies to guide Chinese enterprises’ outbound investment, which has effectively led Chinese enterprises to focus on strategic outbound investment in a more rational way in 2017. EY believes, the Chinese government will encourage Chinese enterprises to participate in global cooperation and competition, and will boost the investments that can help Chinese companies move up the global value chain. As pressure on capital outflows decreases, we’re seeing a promising long-term increase in China’s outbound investment. In 2017, Chinese enterprises continued to optimize their investment structures to support the transformation and upgrading of the real economy, and meanwhile dramatically reduced “irrational” investments. Capital strength is robust in China. In 2016, the value of Chinese overseas M&As outperformed that of the US for the first time, and China ranked in second place worldwide in respect of outward FDI flows1. 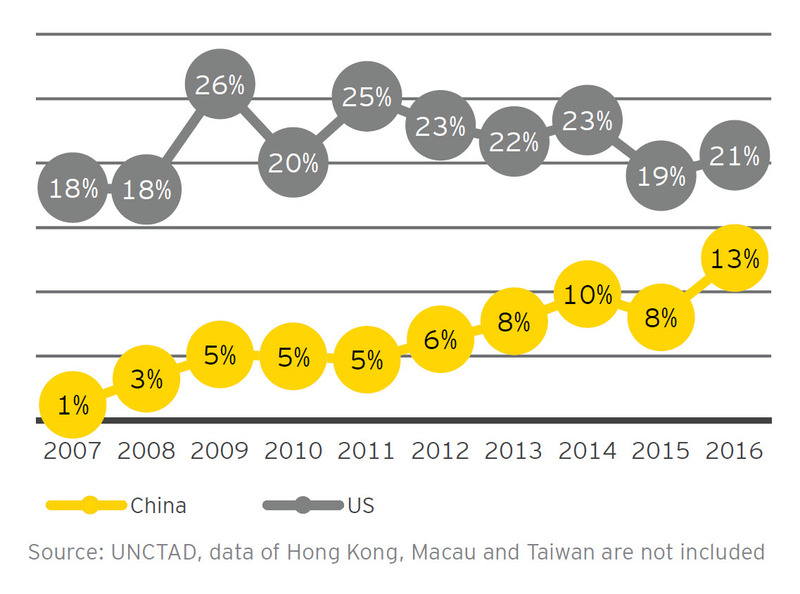 EY predicts that, in the next decade, China’s outward FDI flows are likely to surpass those of the US. Despite the significant changes in the political landscape of Europe and the US, which have exacerbateduncertainty and instability, most global investors are still optimistic about cross-border deals in 2017. Tradingopportunities are expected to increase significantly as a result of various “uncertainties”. 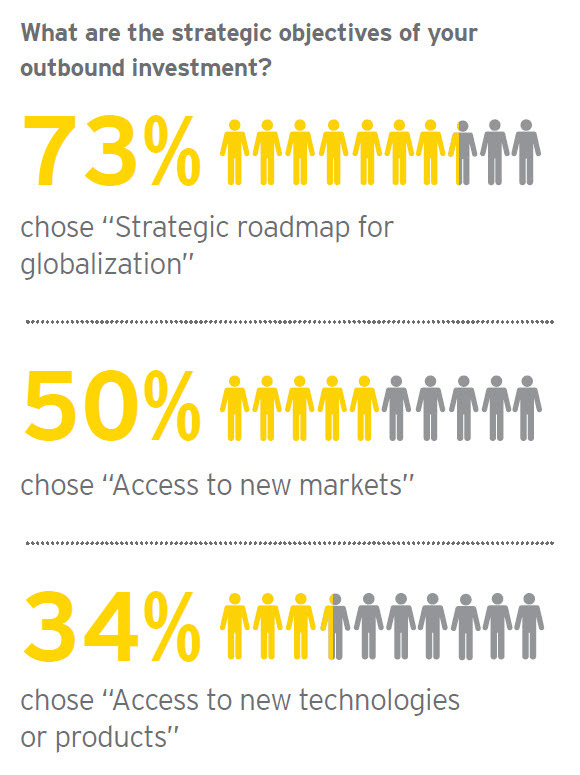 According to EY’s recently released 16th edition of the Global Capital Confidence Barometer, 64% of the respondents claimed that they were looking for suitable targets for cross-border M&As because they believed that trading opportunities were expected to significantly increase as a result of various “uncertainties”. Against a backdrop of rising wave of anti-globalization and weakening international security and economic mechanisms, China is rising and playing an increasingly important role on the international stage in promoting trade and investment globalization, strengthening multilateral cooperation and facilitating regional “win-win” development. 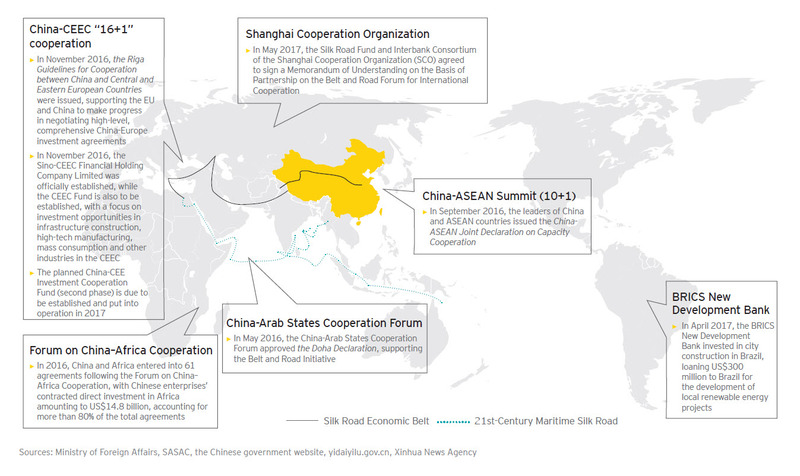 The Belt and Road Initiative contributes to realizing the potentials of developing countries to promote economic globalization in a more general, inclusive and impartial way, by strengthening cooperation and connectivity among these countries. This will bring great business opportunities, achieve “win-win” results, and enhance the stability and far-reaching development of the world. The Belt and Road Initiative will play a “new leading role” in globalization. 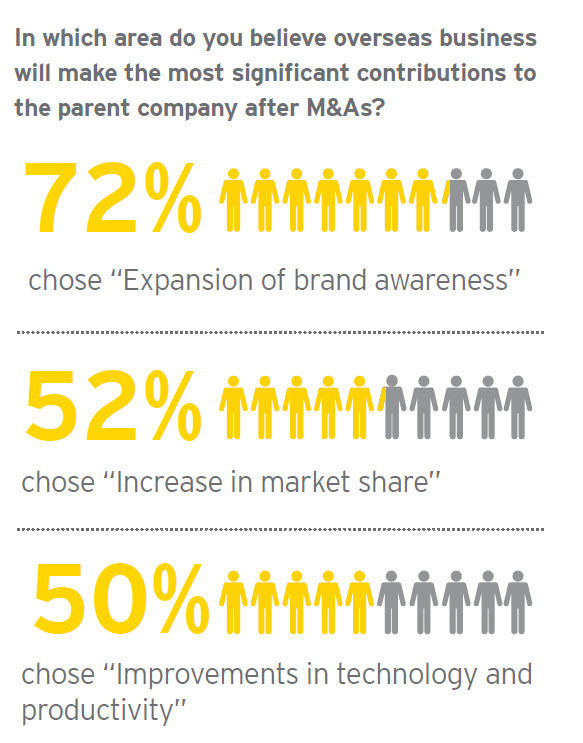 Nowadays, buyout funds play an important role in overseas M&As and have become a major driver in promoting these deals. The buyout funds should improve domestic and foreign M&A talent development and exchange, by means of dispatching people to study, visit and work abroad. To better understand and analyze the gains and losses of Chinese enterprises in overseas business operations and management, EY issued questionnaires to Chinese enterprises that have invested abroad or intend to do so. The respondents were executives or department heads who were directly involved in overseas investment. Chinese enterprises are now at a critical stage of strategic transformation, in which overseas M&As havebecome a major method for them to realize transformation and upgrade their performance. The objectivesof Chinese enterprises’ overseas M&As have evolved from just providing access to resources such as energyand minerals. Many enterprises are now focusing on global expansion to make all-round progress in marketshare, technology and other areas. Given the high correlation between Chinese enterprises’ strategic objectives for outbound investment and the contributions of their overseas business, the survey demonstrates that the benefits and outcomes contributed by overseas business are basically in line with Chinese enterprises’ established strategic objectives and planning. It also reflects that Chinese enterprises’ strategic roadmap for globalization has gained considerably from their expanded brand awareness, access to advanced technologies, increase in market share and other improvements. In the future, while benefiting from acquired brands, markets and technologies, Chinese companies could regularly examine whether their overseas strategies are well carried out in the operations of the their overseas business. In order to promote industrial transformation and diversified management worldwide, and strengthen the operational foundation of overseas business to meet various challenges, Chinese enterprises should attach equal importance to the expansion of overseas business and the development of a diverse and inclusive business environment, so as to mitigate the differences between Chinese and foreign enterprises in terms of corporate culture and governance philosophy, as well as the legal, tax, talent management and other differences across a range of countries and industries. 2. What is hindering Chinese enterprises' overseas business: culture, strategy or talent? Chinese enterprises have recognized the major challenges involved in the long-term operation and management of overseas business – from corporate cultural integration to the alignment of strategic objectives and the challenges of attracting talent and avoiding talent drain. Chinese enterprises should develop and implement detailed integration plans and introduce the principle of diversity and inclusiveness (D&I) to help navigate the challenges arising from deepening globalization. 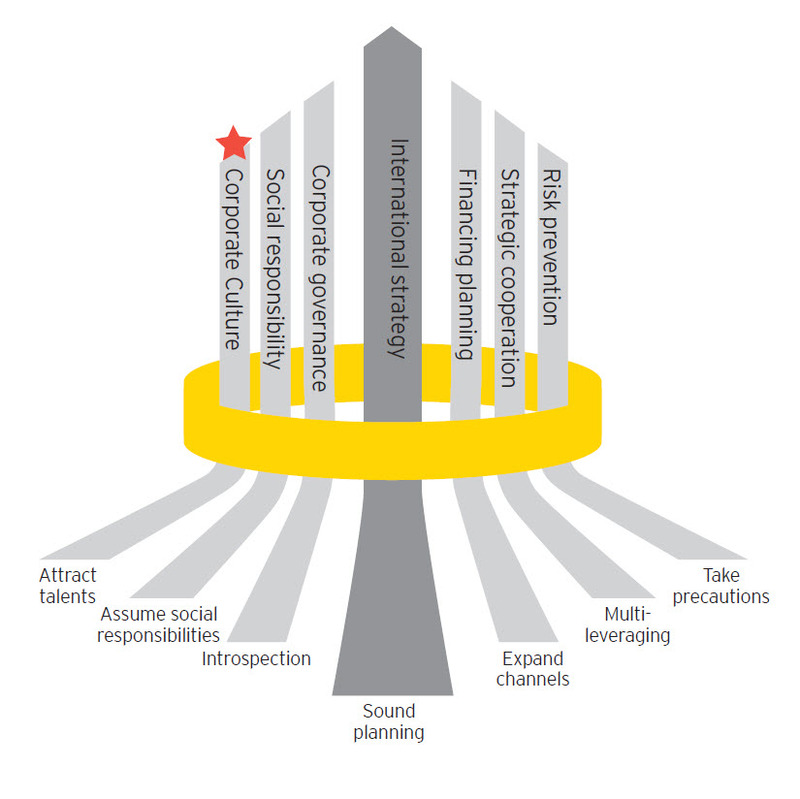 EY has observed that in western culture, the enterprise emphasizes employee-friendly management and a flexible working environment, and its employees value work-life balance; in Chinese culture, the enterprise places greater value on diligence and dedication, and its employees are accustomed to working overtime.The two opposite corporate cultures can easily lead to friction. 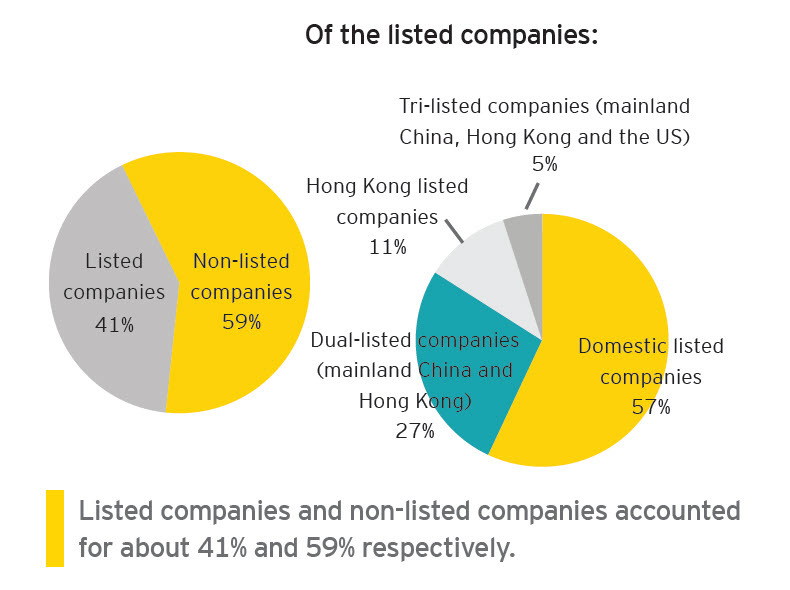 Prior to investing, Chinese enterprises should strengthen their risk assessment of local and corporate culture and geopolitical situations, conduct due diligence and assessment with the help of professional organizations like EY, design management models for different stages of investment (e.g. Chinese enterprises could delegate more to their acquiree in the early stages, and gradually retrieve the power later), and develop a more inclusive corporate culture, in order to create a diverse business environment in which colleagues with different backgrounds are mutually respected and understood. Through such management, relationships between investors and investees should be allowed to gradually develop into more reasonable and balanced ones. Chinese enterprises should specify their M&A strategies prior to investment, analyze the target companies’ development vision and strategies from a professional perspective, and screen them effectively. During the integration stage, Chinese enterprises should try to realize synergies and maximize their return on investment. At the same time, facing a changing market environment, they should also seek an exit as early as possible once they confirm the deal doesn't fit their strategies well. Chinese enterprises should conduct sufficient human resources due diligence work before investment, adjust corporate strategies based on their strategic M&A objectives, and implement active "talent management", which aims at maximizing talent efficiency on the prerequisite of legal compliance. Lack of experience in overseas business management sometimes limits Chinese enterprises’ target selection, which results in fewer qualified targets overseas, while at higher prices. This leads to a vicious cycle. Therefore, Chinese enterprises should enhance their overseas business management capabilities. We suggest that Chinese investors aim at “seeking battle after the victory has been won", rather than "fighting first and looking for victory afterwards". 1. What is diversity and inclusiveness (D&I)? Enterprises that invest extensively in D&I are more likely to coordinate better as a team, retain more people, gain a greater market share and win in new markets. Diversity is about all differences. Each of us is different. For individuals, diversity may refer to having different educational, gender, ethnic, national, generational, and religious backgrounds. Diversity may also mean being of different ages, having different sexual orientations as well as working and thinking styles, or working for different departments and possessing different abilities and skills, etc. Each enterprise is also different. For enterprises, diversity may refer to engaging in different industries, geographical areas, and developmental stages, etc. Inclusiveness is about leveraging these differences to achieve better business results. It refers to creating an environment where all people feel recognized and valued. D&I principle should be embedded into all the stages from planning to integration during an overseas investment, and be reflected in areas such as risk and return, legal and compliance, financial and control, and people and culture that enterprises pay special attention to in the investment. According to our research, talent internationalization and talent localization are two key challenges faced by Chinese enterprises when it comes to outbound investment. 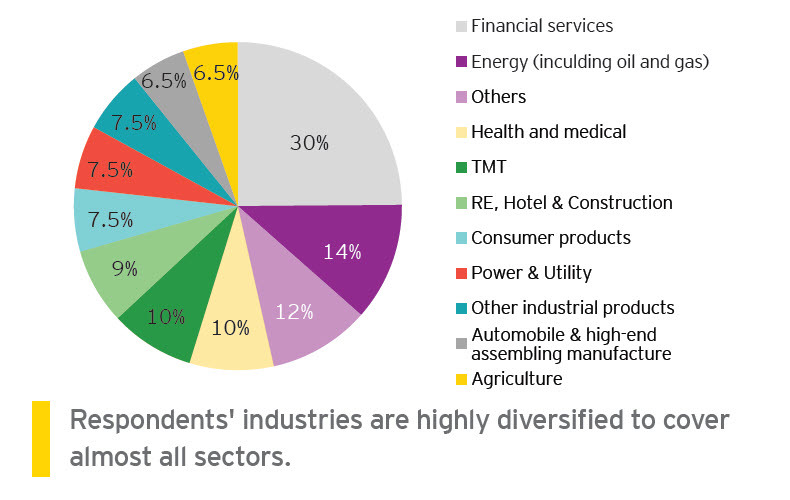 EY recommends that, at each stage of outbound investment, Chinese enterprises should seek to balance the two strategies based on industrial characteristics and economic strength, and make full use of the professional advisory team from a third-party intermediary to optimize their talent structure, so as to achieve better business results. As many European countries have introduced gender quotas for boards of directors, Chinese enterprises must not only respect cultural differences between country and country, but also consider how to achieve greater gender diversity when actively expanding overseas. An excellent team, especially one with local talent and international vision, cannot be cultivated overnight. Therefore, enterprises should advocate for D&I at both an organizational and an individual level. Having both the corporation and the employees grow together will increase talent retention rates and enhance the company’s attractiveness for employees. Driven by globalization, more and more multinational companies are now being required to reshape their corporate culture to make it more inclusive in a diverse global environment. EY believes that only when enterprises take advantages of different views, perspectives and cultural considerations to cultivate the highest-performing teams, can they win in the global marketplace. EY’s experience shows that the difficulty in integrating corporate cultures also lies in the fact that “cultural integration” is sometimes misinterpreted as “cultural migration” – despite some Chinese enterprises knowing that cultural integration is the key to success in overseas acquisitions, they simply implanted the domestic corporate culture and management approach into the acquired enterprise in practice, with the original culture of the overseas enterprise sometimes even being destroyed. Without strict implementation standards and evaluation systems, many managers often overlook this topic during the M&A process. As a result, they may fail to realize the final value of such transactions. 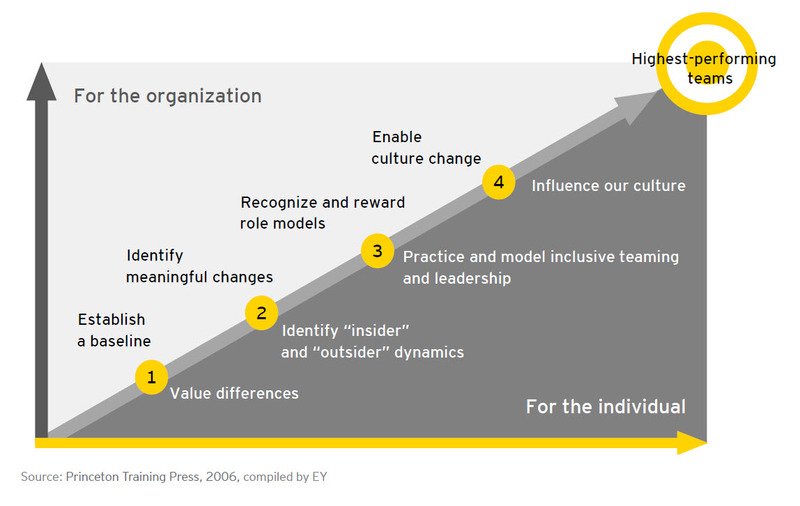 EY’s corporate cultural integration framework is designed to facilitate cultural integration from four concrete perspectives: incentives, leadership, decision frameworks and organization. Learn to delegate: Replace your management team if you cannot trust them completely, or let them make independent decisions, especially on those vital decisions related to local issues. Respect cross-cultural differences: For example, many European countries adhere strictly to the cultural concept of balancing work and leisure. Local staff in these countries will often prefer to pursue a work-life balance. Communication is key: A bilingual, or even trilingual team (especially in the Middle East and North Africa) is the key to effective communication. Of course, how you communicate is also important. Form robust teams for both domestic and overseas transactions. Do not avoid risks overly: In many cases opportunities always come with challenges. Prepare as early as possible. Do not wait until a problem emerges in any section. 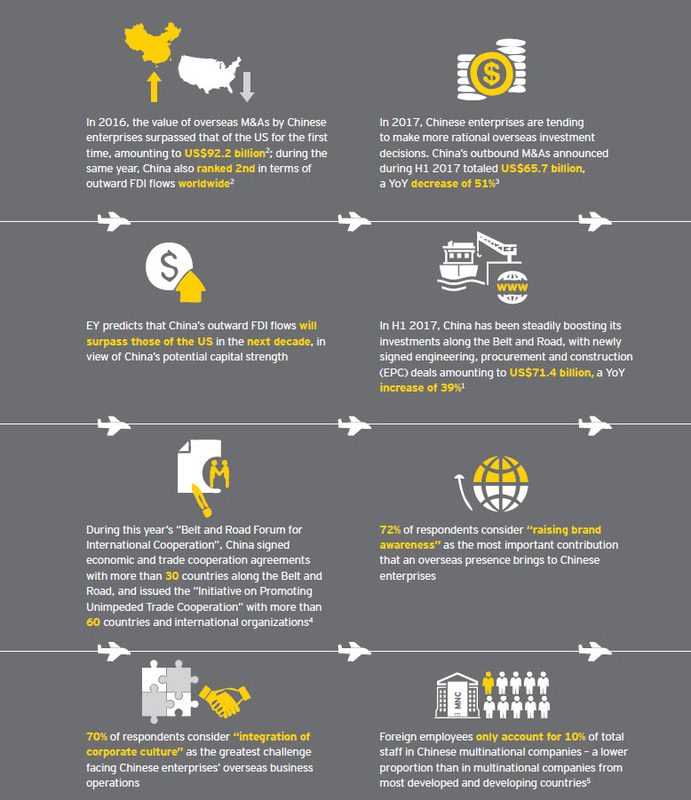 The China Overseas Investment Network (COIN) links EY professionals around the globe, facilitates collaboration, and provides consistent and coordinated services to our clients with overseas investment from China. Building on the existing China Business Group in the Americas, EMEIA, Asia-Pacific and Japan areas, COIN has expanded our network in 66 countries and territories around the world. Our globally integrated structure enables us to deploy dedicated teams with strong local experience, and profound industry knowledge to provide our clients with one-stop professional service from planning stage to execution stage to integration stage, helping our clients navigate through global markets.